Few conventional treatment options are available for patients diagnosed with cerebral palsy, which mostly focus on helping the patients to cope with their disability. However, none of these other options are actually treating the loss of neurological function caused by the original cerebral injury. Stem cell treatment for cerebral palsy (CP) has the ability to regenerate repair damaged cells in the body, helping to reverse the symptoms and allowing cerebral palsy patients to improve. Cerebral palsy is an umbrella term for many possible symptoms that arise as a result of damage to the developing brain in the cerebral hemispheres, responsible for controlling movement, speech, learning, and more. This brain injury is acquired before, during, or shortly after birth and considered non-progressive. 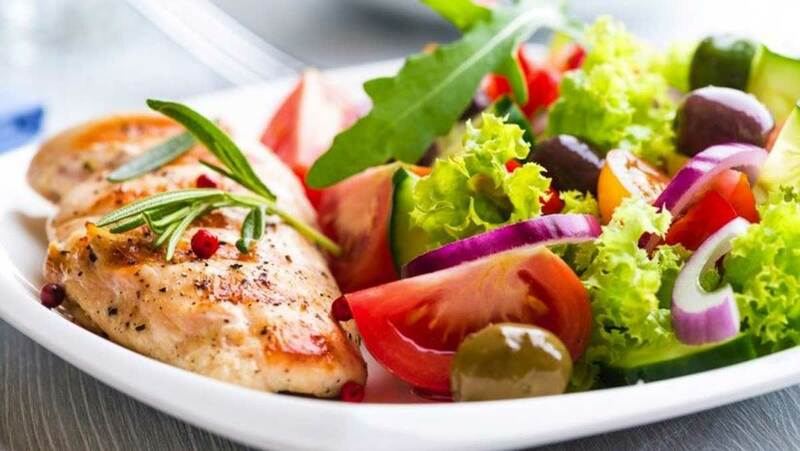 The symptoms can include but are not limited to muscle weakness, general motor control problems, eating, swallowing, coordination, and even problems with cognitive function. Specific causes could be from the brain developing in an unusual way, infections during pregnancy, physical injury, complications in premature birth, critical illness at birth, lack of oxygen to the brain (hypoxia/anoxia), neonatal jaundice and kernicterus, etc. This is not an exhaustive list. There are many other possible causes that can be in any combination to cause the symptoms experienced by one person. It is important to understand that because cerebral palsy is largely an umbrella term and is defined based on the result of the condition rather than the specific cause, no two cerebral palsy patients suffer in exactly the same way. How can stem cells help cerebral palsy? 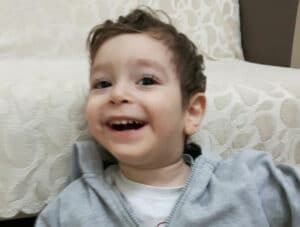 Due to the nature of the condition, (many patients with the same condition but different causes), improvements in cerebral palsy patients can be difficult with conventional treatment, and damage is often viewed as irreversible. Injury is usually a one-time event, and the resulting condition is because the immune system is unable to reverse or repair damaged brain cells. 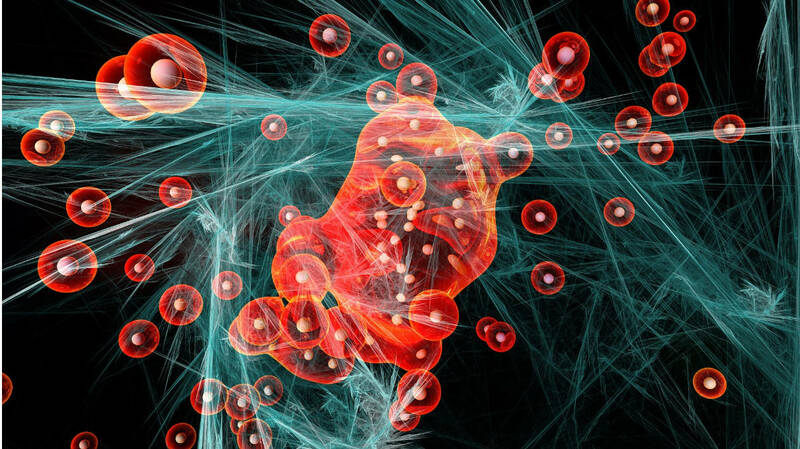 Stem cells are responsible for differentiating into new cells when old ones die or are injured. They are able to become skin, blood, muscle, bone, and more. One of the cells they can become are neurons in the brain. This creation of new cells is the source of healing, regrowth, and continued life. A stem cell treatment, by injecting concentrated, potent stem cells into the body, is able to stimulate the immune system, providing an extra boost and repair damaged brain cells as well as create new cells that the body needs. For neurological conditions, the most important area to send stem cells is the brain, so that new neurons may be created for proper brain function. Stem cell treatment for cerebral palsy is more effective in younger children because the body is still growing, attempting to repair damaged brain cells, and also learning to adapt around this injury to achieve maximum brain function. 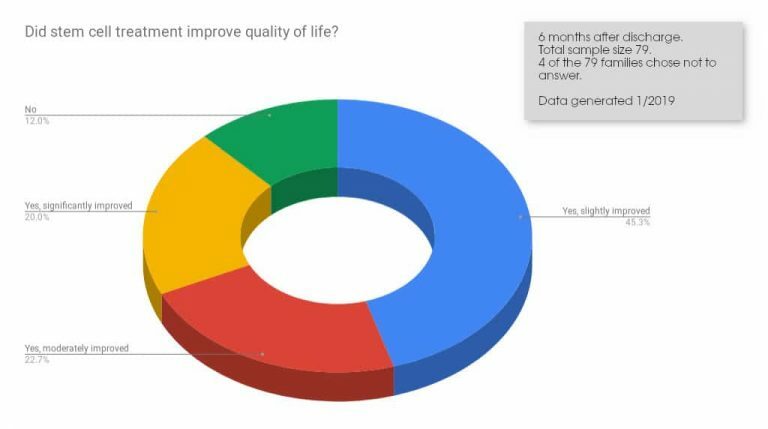 "The intensive support program is unique to Beike and was one of the main reasons we chose them... I wish that stem cell treatment was available in the UK, but until it is, we hope to continue working with Beike and we hope to return for a third time in the future." 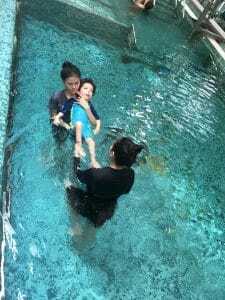 "Today, my son’s condition has improved a lot. Referring to his physical abilities, he has made the biggest progress. He speaks fluently with no more difficulty in speaking. He goes to school and he expresses himself coherently... I highly recommend to all those who have health problems, to try this therapy and to really believe that they will be able to get better." "The transformation in Flynn from before to after the stem cell treatment has been significant. Flynn could not speak. After the treatment, he can talk... He is still improving well now, 12 months on." "We had many expectations, but we were not hoping for a miracle... Seeing a result only 15 days after the first injection was very emotional... We would like to thank the people from Beike for the treatment we received." “From the beginning with Bieke I was surprised with the quick response from [our doctor] every time I sent an email asking a question. He was with me all the way, sending emails before, during and after leaving [the hospital]. The staff at Beike also helped me to contact one of the parents I saw in a testimonial video on the website... She has become a friend of mine now after a lot of emails which gave me more confidence to do the stem cell treatment." How do you know if you have cerebral palsy? Spastic: this is the most commonly seen form, in which muscle tone is increased, causing muscles to feel stiff and movements to look jerky. Dyskinetic: this form causes involuntary movements that can be twisting, repetitive, slow, or unpredictable. This affects 10-15% of cases and can be very severe. Ataxic: this form is characterized by shaky movements that can cause problems with balance, coordination, spatial positioning, posture, and even the control of eye movements. 5% of cerebral palsy patients have this. Any mixture of these three forms is possible as well. Diagnosis is generally determined after doctors look at an MRI of the patient’s brain coupled with observed symptoms. The patient is also tracked throughout childhood to monitor the pace of important developmental milestones such as crawling and walking. As of now, there is no cure for cerebral palsy (CP). Therapies that treat cerebral palsy are for the purpose of helping to mitigate and make symptoms more manageable, especially in terms of making communication less difficult. There are a number of different areas within the disease that can be helped, and often a cerebral palsy patient will work with many types of doctors to improve on many fronts. Medications exist for patients that have need to relax stiff muscles, and to address some feeding problems in babies. Physical therapy and occupational therapy can help improve a patient’s mobility or ability to perform daily tasks, and speech therapy can be used to improve communication skills. For the most part, therapy and medications are viewed as positive interventions to manage the condition, but as in all areas of medicine, some uncertainty and disagreement exists about what and when is best. One of the more new and promising treatments, however, is stem cell treatment for cerebral palsy. There have been many studies done on cell therapies for cerebral palsy, and clinical trials have shown that stem cells have been effective in improving CP symptoms.1One of the most impressive studies to date on stem cell treatment for cerebral palsy is from Duke University in the United States. Duke conducted a randomized study of 63 CP children with different varieties and severities of spastic cerebral palsy. The children’s parents had placed their child’s cord blood stem cells in a blood bank after birth, and after the children were treated with their own cord blood cells, they were shown to see improvements in their motor function just a year later. These improvements were better than those of other CP children of similar age and condition, and better than those that were given fewer stem cells or none at all. One of these children’s stories can be found here. Senior author of the study Joanne Kurtzberg, M.D., is the director of Duke’s Pediatric Blood and Marrow Transplant Program and the Robertson Clinical and Translational Therapy Program. She strongly believes in stem cell treatment for cerebral palsy, saying, “previous research has indicated it’s safe for children with cerebral palsy to receive an infusion of their own cord blood. These cells are also able to release products such as cytokines and growth factors that contribute to neural protection,3 and when injected into the brain can stimulate the body’s own repairing of damaged neural cells. The collection of stem cells for treatment can be done in many ways. It could come from fat, bone marrow, umbilical cords, and more. It could come from the patient’s own body (autologous) or from a donor (allogenic). For CP patients, the most common method of injecting stem cells for treatment is either through an intravenous infusion into the bloodstream (an IV), or intrathecal injection below the spinal cord. While IV injections are a more systemic delivery aiming for cell generation in various areas of the body, the spinal cord injection can help the stem cells reach the brain better. Stem cell treatment for cerebral palsy combined with rehabilitation has shown positive results and is the most commonly preferred option. This combination method was used for the study as well. The graphs of the changes in the Gross Motor Function Measure (GMFM-88) score (the measurement tool for severity of CP in terms of motor function) and the comprehensive functional assessment (CFA) score (a more comprehensive measurement that includes cognizance and comprehension) can be seen in the graphs below. This trial shows both the safety and efficacy of using human umbilical cord mesenchymal stem cells (MSC) in children with cerebral palsy. Full study here. “Conclusion: Using cord blood stem cells to treat CP can improve gross motor function while not causing any harmful effects to immune-system functions.” Full study here. “Conclusion: This study highlights that cells found in UCB is able to mediate neuroinflammation and is an effective neuroprotective therapy. Our study also shows that particular cells found in UCB, namely EPCs, may have an added advantage over using UCB alone. This work has the potential to progress towards tailored UCB therapies for the treatment of perinatal brain injury.” Full study here. and could be included in treatment and rehabilitation programs for juvenile patients with cerebral palsy.” Full study here. Study shows that among 47 patients, no serious adverse effects were recorded, and milder adverse effects were not shown to be related to stem cell treatments. Full study here. “Without question, stem cells therapies hold promise for the treatment of a wide range of neurological disorders, including for the treatment of perinatal brain injuries.” Full study here. Conclusion: “Given that inflammation plays a pivotal role in CP, our results suggest that allogeneic hUCBCs therapy may be an appropriate strategy for CP treatment.” Full study here. 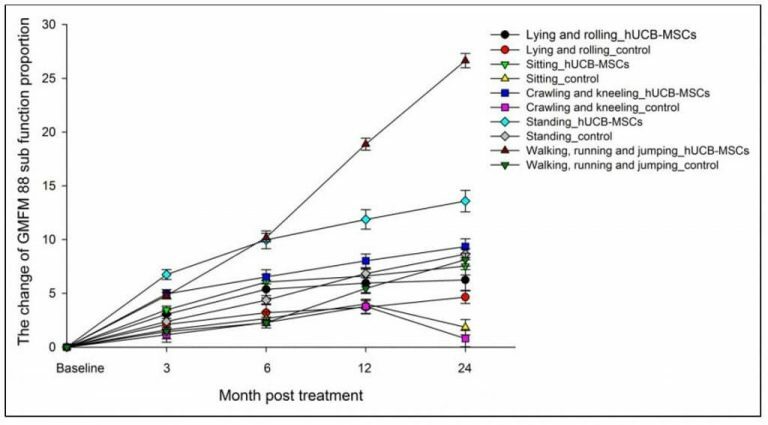 Conclusion: “The clinical application of hUC-MSCs combined with basic rehabilitation treatment was effective and safe for improving motor and comprehensive function in a patient with CP.” Full study here. At Stem Cell Treatment Now, among our 22,500+ patients, we have had a large number of cerebral palsy patients join our program for treatment. 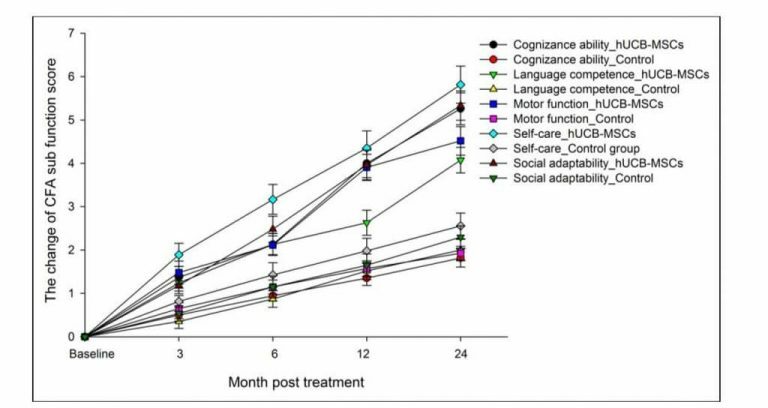 Our results regarding stem cell treatment for CP can be seen in the two graphs below. 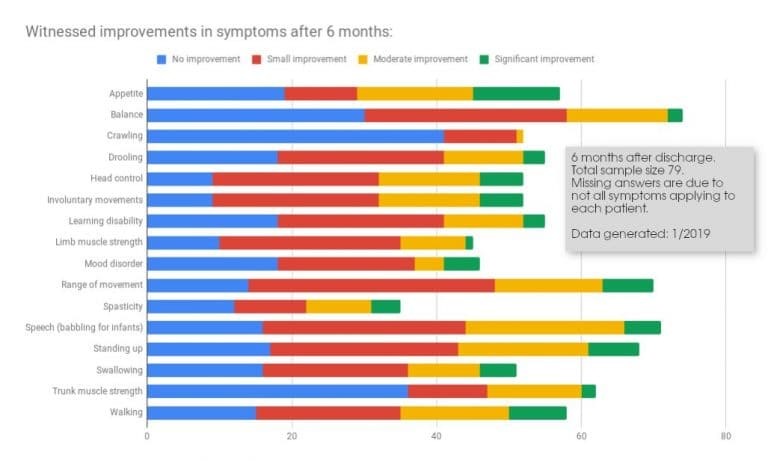 The first shows the improvements at the 6 month mark after discharge, which is measured by the most common symptoms experienced by CP patients. Of course, not all symptoms apply to all patients, therefore the numbers can be uneven across symptoms. Below are video interviews recorded during treatment with Beike stem cells. The families showcased in these videos talk about their personal stories and their experience of the treatment including the improvement noticed. The improvements mentioned in these videos are typical, however it does not guarantee that all patients may have the same improvements. What conventional treatment is currently available for cerebral palsy? Current treatment for cerebral palsy consists of medication as well as physical and occupational therapy. However, these treatments are intended only to mitigate symptoms and make them more manageable, and do not address the root cause, which is considered complete and irreversible. Stem cells, by addressing the injury obtained in cerebral hemispheres, are able to not only lessen symptoms, but actually reverse some of the original damage and create lasting developments in a child with cerebral palsy. Can stem cells cure cerebral palsy? Right now there is no cure for cerebral palsy. Traditional methods of treatment are able to help manage symptoms. The purpose of stem cell therapy is to restore neurological function in the brain and spinal cord lesion area, and therefore reduce and actually reverse some of those symptoms. However, though these results can be life changing and lasting, this does not count as a “cure” and some milder symptoms will likely remain. What improvements can cerebral palsy patients see from stem cell treatment? It is important to note that, as for any medical treatment, improvement cannot be guaranteed. How do stem cells help CP patients? 5. Reducing the intrinsic cell apoptosis (reducing cell death). 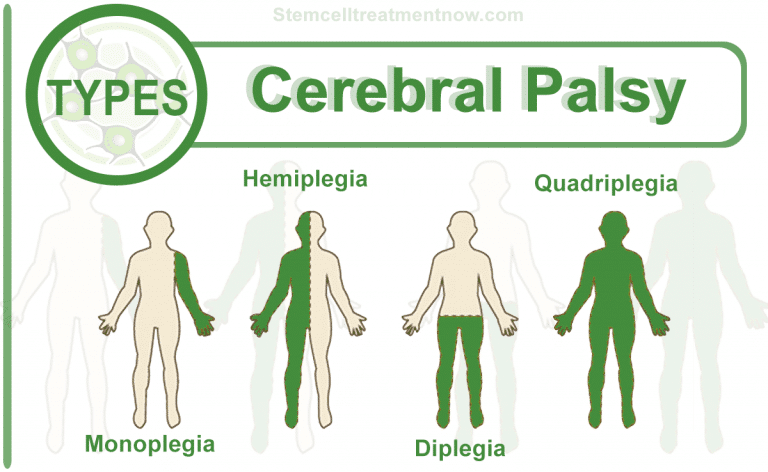 What type of stem cells are used for treating cerebral palsy? Most of our patients diagnosed with cerebral palsy receive umbilical cord blood stem cells (UCBSC). Only patients with RH negative blood will receive umbilical cord mesenchymal stem cells instead. Both types of stem cells are extracted from umbilical cords gathered from healthy babies after birth. What are the possible side effects of stem cell therapy? Only few patients have side effects after stem cell injections. Side effects appear right after injection and can include headache, fever, nausea, dizziness, vomiting or pain in the legs. Side effects are temporary and fade away quickly in most cases. How much does cerebral palsy stem cell treatment cost? Don’t see your question? Ask us here! Fill in the contact form and we will get back to you as soon as we can. Beike is unlike any other stem cell treatment provider in the world, the reason? Since 2005, we have been developing and optimizing our stem cell treatment protocols with the concept that only a very comprehensive solution can allow our patients to truly benefit from stem cells. We believe that stimulation through various therapies is necessary to enhance stem cell regenerative response, therefore our protocols include daily therapies to support the stem cells. Finally, we provide a wide variety and large quantities of stem cells in order to adapt to each patient specific condition and deliver maximized regenerative potential. Learn more about all the particularities that make our treatment truly comprehensive and unique. Get a free medical evaluation of you or your loved one’s condition – without commitment. stem cell treatment for cerebral palsy could be right for you.